The Miskatonic University Library Association brand is no more, alas, but what we have in its stead is the Miskatonic Repository, based on the same format as the DM’s Guild for Dungeons & Dragons. It is thus, “...a new way for creators to publish and distribute their own original Call of Cthulhu content including scenarios, settings, spells and more…” To support the endeavours of their creators, Chaosium has provided templates and art packs, both free to use, so that the resulting releases can look and feel as professional as possible. 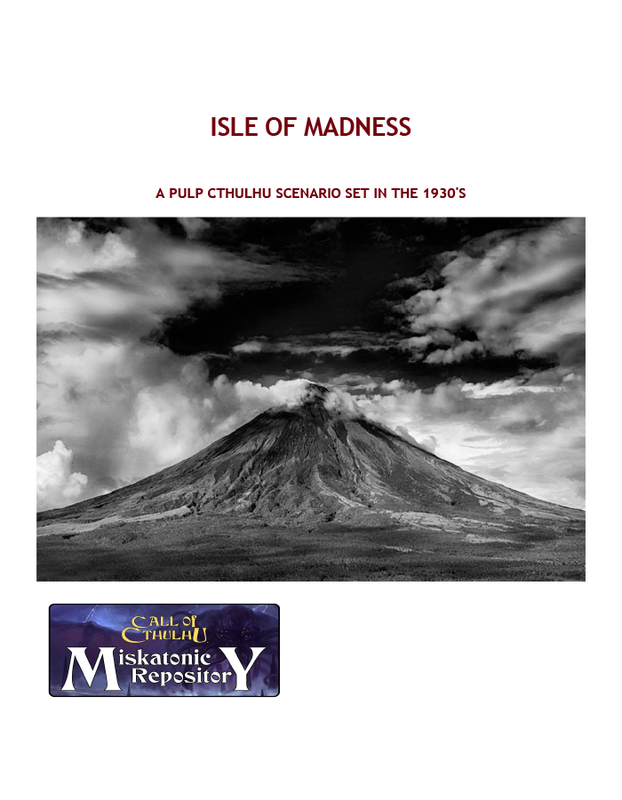 To support the efforts of these contributors, Miskatonic Monday is an occasional series of reviews which will in turn examine an item drawn from the far reaches of the Miskatonic Repository. Plot Hook: The heroes are shipwrecked off a secret island in the North Atlantic and get caught up in a Mad Scientist’s plans for revenge on his batrachian brothers. Plot Development: Friendly not-Deep Ones, a big tank of water in the Mad Scientist’s lair, evil plans, and sharks. Plus a giant robot! In a volcano!! Plot Support: Fully plotted out with eight NPCs, scenes and events, and a map of the island. Production Values: Needs another edit and no artwork. The map is scrappy. # Where’s the Mad Scientist’s monologue? # Still want that Mad Scientist’s monologue, dammit!